Vizag Steel Plant Recruitment 2018 – 72 Management Trainee Posts :- Rashtriya Ispat Nigam Limited, Vizag Steel Plant, Visakhapatnam has released latest notification for filling up 72 posts of Management Trainees (Technical) through GATE – 2018. Desirous & eligible candidates can apply online from 16/01/2018 to 14/02/2018. Educational Qualification: Full – time Bachelor’s Degree in Engineering or Technology in Electrical / Mechanical / Metallurgy disciplines from a University/ Deemed to be University / Institute of National Importance, recognized by AICTE with minimum 60% of marks in the aggregate of all years / semesters and all subjects (50% in aggregate for SC/ST/PWD candidates). Starting Date of Online Application : 16/01/2018. 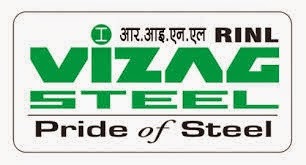 Application Procedure: Eligible candidates may apply online through the website http://www.vizagsteel.com from 16/01/2018 to 14/02/2018..
Rashtriya Ispat Nigam Limited, Vizag Steel Plant, Visakhapatnam has released latest notification for filling up 19 posts of Junior Trainee. Desirous & eligible candidates can apply online from 17/07/2017 to 31/07/2017. Age Limit : 27 years as on 01/07/2017. Educational Qualification: SSC with full time ITI / Diploma in Engineering in the relevant Trades/ Disciplines. Starting Date of Online Application : 17/07/2017. Application Procedure: Eligible candidates may apply online through the website http://www.vizagsteel.com from 17/07/2017 to 31/07/2017. Subscribe our free job alert mail for Vizag Steel Plant Recruitment 2018.